Copyright © 2013 Kazuhiro Uemura. This is an open access article distributed under the Creative Commons Attribution License, which permits unrestricted use, distribution, and reproduction in any medium, provided the original work is properly cited. Platinum mononuclear complex, cis-[PtCl2(PyCN)2] (1, PyCN = 4-cyanopyridine), has been synthesized and characterized by single-crystal X-ray analysis. Compound 1 crystallizes as yellow plates from the reaction of a mixture of K2PtCl4 and PyCN (=1:2) in H2O, that was left to stand at room temperature with the addition of Me2CO. Compound 1 forms the square-planar coordination geometry around the Pt atom coordinated to two Cl– ions and two pyridines of PyCN ligands in cis position. Single crystal of 1 shows the temperature dependent phase transition around 140 K, where the crystal space groups change from P21/c (high temperature) to (low temperature), which is caused by the stabilization of intermolecular interaction. Single-crystal-to-single-crystal transformations involve regularly cooperative movements of atoms in the solid state, maintaining the single crystallinity . Classical studies on the solid-state reactivity of different polymorphs paved the way to understanding topochemical reactions in molecular crystals , and numerous later examples such as racemization, crystalline-state reaction, and photoisomerization have been revealed by the direct observation of crystal structures [3-5]. Infinite coordination networks also exhibit structural transformation in the solid state [6,7], and open metal-organic frameworks show crystal-to-crystal transformations accompanied with adsorption/desorption of guest molecules [8,9]. Those transformations processes can be fully understand by Xray diffraction analyses, because the views of both initial and end crystal structures afford direct information of transform mechanism. 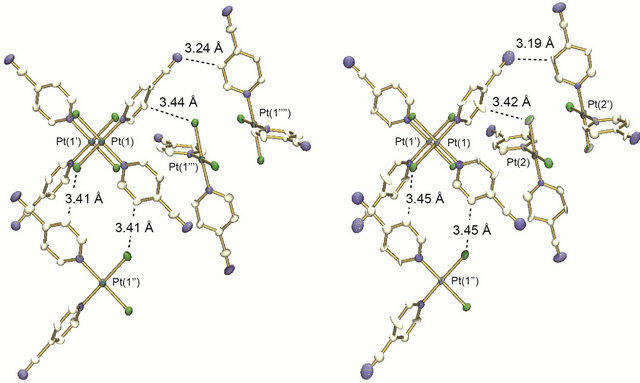 For example, in spin-crossover compounds [Fe(btz)2(NCS)2] and [Fe(phen)2(NCS)2] (where btz = 2,2’-bi-4,5-dihydrothiazine and phen = 1,10-phenanthroline), obvious differences in coordination bond distances attributed to low or high spin configurations in FeII centers are observed, which information were clearly obtained by single-crystal X-ray analyses [10,11]. In this contribution we report on an unprecedented reversible phase transition of cis-[PtCl2(PyCN)2] (1) depending on temperature, which was investigated by the single-crystal X-ray diffraction and IR spectroscopic techniques at various temperatures. Compound 1 consists of platinum mononuclear complex, where significant differences of dihedral angles in the complex and intermolecular distances between high and low temperature were observed. K2PtCl4 was obtained from Tanaka Kikinzoku Co. PyCN was obtained from Tokyo Kasei Industrial Co. IR spectra were recorded with samples prepared with KBr. An aqueous solution (2 mL) of K2PtCl4 (83 mg, 0.2 mmol) was stirred with 2 equiv of PyCN (42 mg, 0.4 mmol) at room temperature for 5 min. The crystals of 1 were obtained after slow evaporation of the solvent with the addition Me2CO (2 mL) for a few days at room temperature. Elemental analysis of calcd for C12H8Cl2N4Pt: C, 30.39%; H, 1.70%; N, 11.81%, found: C, 30.35%; H, 1.60%; N, 11.56%. Measurements were carried out on a Bruker SMART APEX CCD diffractometer equipped with a normal focus Mo-target X-ray tube (λ = 0.71073 Å) operated at 2000 W power (50 kV, 40 mA) and a CCD two-dimensional detector. A total of 1315 frames were collected with a scan width of 0.3˚ in ω with an exposure time of 5 sec for each frame. The frames were integrated with the SAINT software package with a narrow frame algorithm . Absorption correction was applied by using SADABS . The structures were solved by the direct method  with the subsequent difference Fourier syntheses and the refinement with the SHELX-97  operated by YadokariXG software package . Non-hydrogen atoms were refined anisotropically and all hydrogen atoms were treated as riding atoms. 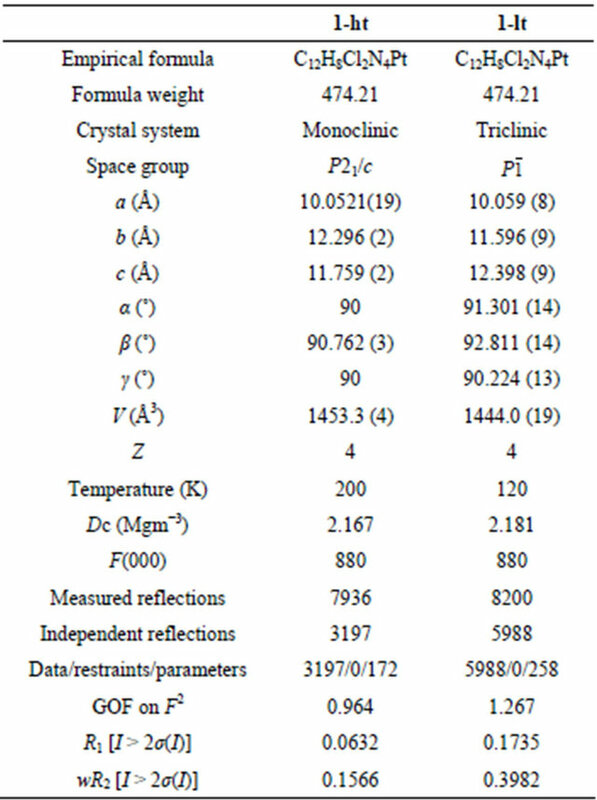 The crystal data and structure refinement results are summarized in Table 1. In 1-lt, PyCN ligands (N1-3, N5, C1-3, C6-7, C9-10, C12, C15, C17-18, and C20-21) were isotropically refined. Figure 1 shows the crystal structure of cis-[PtCl2(PyCN)2] (1-ht, measured at 200 K). The structure consists of discrete molecules, where the platinum atom is coordinated to two Cl– ions and two PyCN ligands with cis fashion. The PyCN ligands are coordinated at the pyridine sites with the distances of Pt-N = 2.002(9) Å, and Cl– ions are coordinated with Pt-Cl = 2.287(3) and 2.288(3) Å, which are in agreement with analogous distances reported previously [17-20]. The dihedral angles of the pyridine rings with respect to the coordination plane are 54˚ and 75˚. The molecules pack in the crystal to be pairs with centrosymmetrically relationship (Figure 1), as similarly found in cis-[PtCl2(NH3)2] , cis-[PtCl2(en)] (en = ethylenediamine) , cis-[PtCl2(py)2] (py = pyridine) , cis-[PtCl2(pyCH3)2] , and cis-[PtCl2(pyC2H3)2] , which probably minimizes the potential energy between the permanent dipoles of the molecules. In 1-ht the Pt-Pt distance in the pair is 4.52 Å, which is longer than the sum of the van der Waals radii (4.1 Å) of two Pt atoms . In contrast, they are ca. 3.37 and 3.39 Å in cis- [PtCl2(NH3)2]  and cis-[PtCl2(en)] , respectively. The longer Pt-Pt distance in 1-ht originates from a precluding a closer approach by the pyridine rings, which are rotated with respect to the coordination plane (54˚ and 75˚) in order to minimize intramolecular repulsions. Actually, in cis-[PtCl2(py)2], each pyridine ring leans with respect to the coordination plane (56˚ and 62˚), to afford Pt-Pt distance of ca. 4.95 Å . Furthermore, the CN moieties in PyCN are interacted with neighboring pyridine rings with the distance of N-C = 3.24 Å in 1-ht. Figure 2 shows the X-ray diffraction photograph of 1 taken with a fixed-film, a same irradiated angle to the single-crystal, and a same exposure time, at the temperature from 260 to 80 K. In the whole temperatures clear Laue spots are observed, however, there are obvious differences between 160 and 140 K, where the crystal system transforms: 1-ht, at 200 K, monoclinic, P21/c, a = 10.0521(19) Å, b = 12.296(2) Å, c = 11.759(2) Å, b = 90.762(3)˚; and 1-lt, at 120 K, triclinic, , a = 10.059(8) Å, b = 11.596(9) Å, c = 12.398(9) Å, a = 91.301(14)˚, b = 92.811(14)˚, g = 90.224(13))˚. In both ranges of 260 - 160 K (high temperature, ht) and 140 - 80 K (low temperature, lt), each spot becomes clearer as temperature decreases. The original reflection spots appeared again when the cooled single crystal was returned to the high temperature, indicating that this single-crystal-to-singlecrystal transformation is reversible. Figure 3 shows the lattice parameters of 1 at various temperatures. As lower temperature, the cell volume becomes reduced, which is attributed to the reduction of both a and b axes. While, the c axis does not depend on temperature to induce distorted angle of b. Because the platinum molecules are not aligned along the particular axis, further discussion based on the crystal axes is difficult. Table 1. 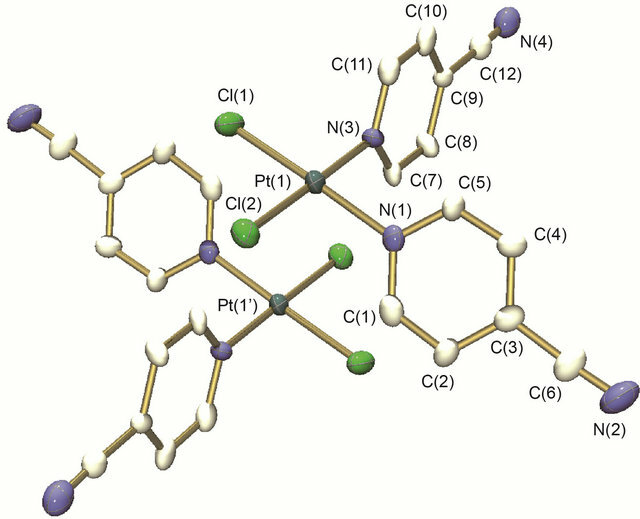 Crystallographic data and structure refinements for cis-[PtCl2(PyCN)2] (1). Figure 1. Crystal structure of cis-[PtCl2(PyCN)2] (1). Hydrogen atoms are omitted for clarity. Figure 2. X-ray diffraction photograph of 1 taken with a same ω over the temperature range from 80 - 260 K.
Several porous compounds containing solvent molecules as guests show structural changes induced by the guest transformation or adsorption/desorption of guest molecules [8,9]. Whereas, despite no solvent molecules in the crystal, compound 1 exhibits the temperature dependent phase transition. Figure 4 shows the packing structures of five Pt molecules in 1-ht and 1-lt. The obvious difference is Pt-Pt distances: in 1-ht, Pt(1)-Pt(1’) = 4.52 Å; and in 1-lt, Pt(1)-Pt(1’) = 4.33 Å, Pt(2)-Pt(2’) = 4.68 Å, where the number of independent atoms measured at 120 K doubles compared with that at 200 K. The shorter and longer distances of Pt-Pt in 1-lt are accompanied with the changes of pyridine ring inclination: 47˚ and 65˚ in Pt(1) molecule; 66˚ and 90˚ in Pt(2) molecule, showing that the stacking each other is obstructed by the steric hindrance of the pyridine ligands. This transformation is caused by some interactions among molecules, where CN moieties and Cl– ions are close to m-positions of pyridine as shown in Figure 4. Particularly, the distances between CN moieties and pyridine (N-C = 3.19 Å) in 1-lt are shorter than those (N-C = 3.24 Å) in 1-ht. Figure 5 shows IR spectra of 1 over the temperature range from 77 to 300 K. Although the phase transition is observed around 140 K, the significant difference of profile is not observed. 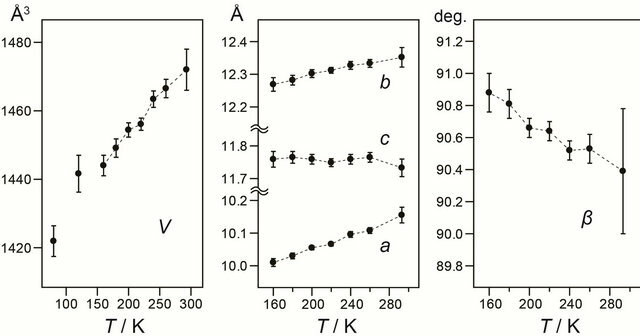 Although the crystal structures show the significant difference, the wavenumber values of CN stretching bands do not change, indicating that this transition is caused in small strains. Figure 3. Temperature dependence of the lattice parameters of 1. Figure 4. Packing views of (a) 1-ht and (b) 1-lt with selected distances. Figure 5. 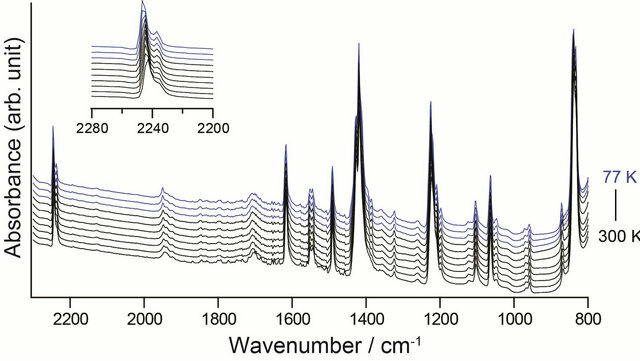 IR spectra (KBr pellet) of 1 at 77, 120, 140, 160, 180, 200, 220, 240, 260, and 300 K. Blue (T ≤ 140 K) and black (160 K ≤ T) spectra are corresponding to the states of 1-lt and 1-ht, respectively. This work is devoted to the synthesis and characterization of cis-[PtCl2(PyCN)2] by single-crystal X-ray analysis at various temperatures. The phase transition around 140 K was fortunately observed, which is attributed to the changes of intermolecular interactions between CN moieties or Cl– ions and m-positions of pyridine, resulted in the significant changes of Pt-Pt distances. This work was supported by the Grants-in-Aid for Scientific Research (Scientific Research (C) 24550074) and Nippon Sheet Glass Foundation for Materials Science and Engineering. The author is thankful to Prof. K. Matsumoto, Prof. Y. Furukawa, and Dr. Y. Hosoi for their kind technical supports. Siemens Energy & Automation, Inc., “SMART & SAINT Software Package, version 5.625,” Siemens Energy & Automation, Inc., Madison, 2001. G. M. Sheldrick, “SADABS, Software for Empirical Absorption Corrections,” University of Göttingen, Göttingen, 1996. C. Kabuto, S. Akine, T. Nemoto and E. Kwon, “Release of Software (Yadokari-XG 2009) for Crystal Structure Analyses,” Journal of the Crystallographic Society of Japan, Vol. 51, No. 3, 2009, pp. 218-224. P. Colamarino and P. L. Orioli, “Crystal and Molecular Structures of cisand trans-Dichlorobispyridineplatinum (II),” Journal of the Chemical Society Dalton Transactions, Vol. 16-17, 1975, pp. 1656-1659.